Catherine Zeta-Jones looked picture perfect in a dazzling maroon frock as she stepped out in New York City on Friday. The gorgeous mother-of-two absolutely glowed in the floor-length dress which featured a thigh-high split at The Royal Welsh College of Music and Drama Gala. With her hair styled in a messy up-do, the actress opted for a pair of dark red heels and dangly earrings, while she chose a dark lipstick to complete the look. The college, located in Cardiff, Wales, teaches some of the most talented students from across the world, preparing them for life in the music and acting industry. Each year the facility holds more than 300 public performances including orchestral concerts, recitals, drama, opera and musical theatre. Catherine’s appearance at the event follows a recent outing with husband Michael Douglas and daughter Carys. The three stepped out just weeks ago for the Michael Kors show at New York Fashion Week. The family beamed as they posed alongside each other for photos after the models had taken to the stage. 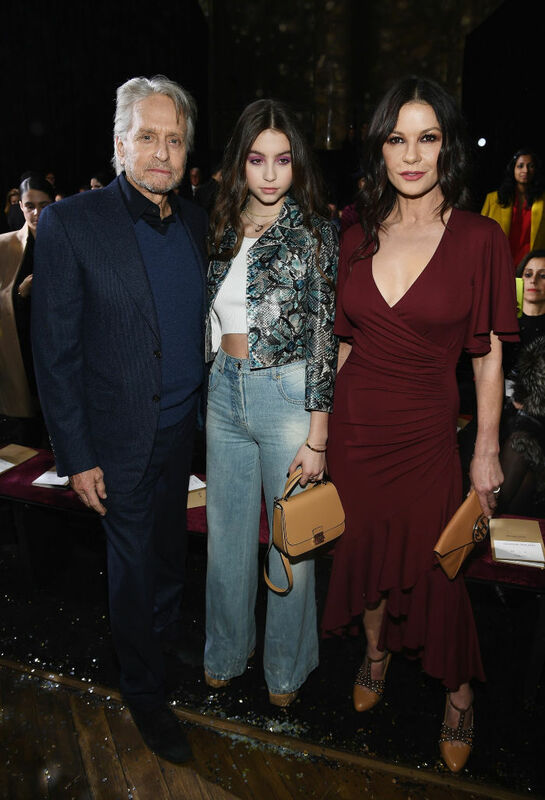 Carys, 15, joined her famous parents at New York Fashion Week. Source: Getty. Standing between her famous parents, Carys looked the image of her mother with her dark locks hanging in loose curls. The teenager, who is also a model, donned a pair of 70s-style flared jeans, paired with a white crop top and colourful snake-skin efect jacket. Catherine oozed sophistication in a tight-fitting maroon wrap dress, which showed off her famous curves perfectly. She finished the look with a pair of studded tan heels and a matching clutch bag. While Basic Instinct star Michael looked dapper in a navy suit, wearing the jacket open with a sweater underneath and no tie. Catherine also shared an image of the trio on Instagram as they made their way to the fashion show. Earlier that week, the Welsh screen siren sent fans wild when she shared a sweet video of her dancing alongside her husband and their children Dylan, 18, and Carys. Are you a fan of Catherine Zeta-Jones? What do you think of her outfit choice?